Worcester have made New Zealand-born centre Jackson Willison their second signing for the 2016-17 season. 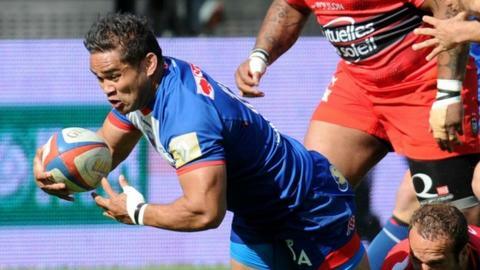 After the recruitment of fellow centre Ben Te'o from Leinster, they have now added Willison, who currently plays for Grenoble, the same French Top 14 side as former Warriors lock James Percival. "His experience in southern and northern hemisphere (rugby) stands him in good stead," said boss Dean Ryan. "Jackson is a talented athlete who will add some firepower to our midfield." Warriors, promoted back to the Premiership in May after a season's absence, currently stand 10th in the table, eight points clear of bottom club London Irish. Former New Zealand Under-20 international Willison added: "After speaking with Dean, I felt this was a great opportunity for me. "I've had a great time in France with Grenoble, but I felt this was the right time to move to the UK." Willison spent five seasons in Super Rugby, winning the title with New Zealand side Waikato Chiefs in 2012, and scoring six tries in 37 appearances. He headed north to join Auckland in 2013 before moving to France in time for the 2014-5 campaign. He has gone on to make 33 appearances for Grenoble in the Top 14 and European Challenge Cup. The 27-year-old previously captained ITM Cup side Waikato, scoring 13 tries in 50 games to help the North Island side reach the final in both 2010 and 2011.